Mansfield Town pulled off a vital win at Torquay United this afternoon to pull themselves a little further clear of relegation. The Stags certainly deserved all three points and were indebted to goals from Danny Reet, early in the game, and substitute Simon Brown, late in the game. Peter Shirtliff had played down the importance of the game during the week; quite rightly trying to take some pressure off the players. But there was no doubt that this was a crucial game, a true six-pointer. A win for the Stags and they’d be a huge 9 points clear of the Gulls with just 11 games left. But a defeat and the gap would be down to 3 points. The Stags manager made just one change to the side that had drawn with Wrexham: Uhlenbeek replacing the suspended Coke, and playing on the right side of midfield, with Dawson moving into the middle. 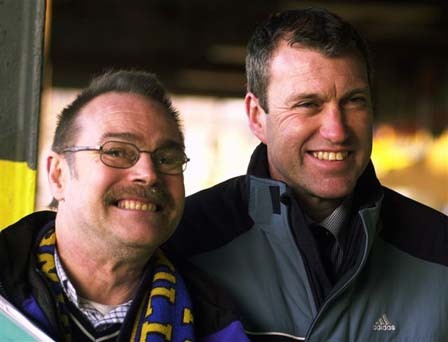 Simon Brown was on the bench, we believed this to be his final game before a hernia operation, but after the game, Shirtliff revealed that the operation may be delayed due to the availability of the surgeon. The Gulls had Sutton-in-Ashfield born Andy Marriott in goal. There was a superb following of 247 Stags fans, congregated behind one goal and down the side. 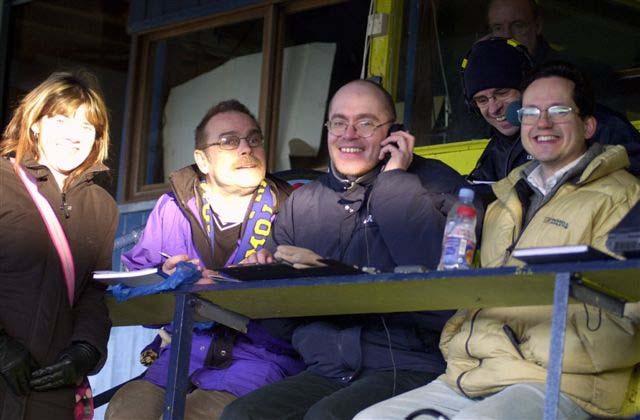 Meanwhile Svante and I were cramped into the pathetically small press area, where Jason Harrison and I did the radio and internet commentary via two mobile phones, because the home club could not provide a proper phone line. Conference-style press facilities from a club who could indeed be there next season. This friendly little club would be missed, but the facilities within the ground would not. The pitch was dreadful. One patch in front of the main stand resembled a paddy field. But at least the light snow which fell on Thursday night and on Friday down here, was replaced by glorious sunshine, which led to Kevin Pressman wearing a very fetching cap early in the game. The Stags made most of the early running. Reet put in a two terrific runs down the left hand side and looked to be determined to put his recent disappointing spell behind him. And on 10 minutes, he did just that when he scored the vital first goal. The Stags won a free kick near the corner flag on the right. Uhlenbeek took a short kick to Rundle, who cut into the box, before firing low and hard at goal. Keeper Marriott got down to try to save it, but the ball squirmed free and Reet poked it into the net from 3 yards. It was a scrappy goal, but a vital one. Radio commentary here The build-up to the goal was reminiscent of Rundle’s goal against Bristol Rovers over Christmas. The Stags continued to be on top, while Torquay created very little. Reet found himself in space on the right and chipped a super ball high towards the far post where Barker was waiting to put the ball into the empty net, but Marriott somehow leapt high enough to catch the ball with his fingertips. It was 22 minutes before Torquay’s first effort, a shot over the bar from long range. Then on 27 minutes, Baptiste got in a great challenge to block a shot from Kuffour. Then, following a Stags corner, the ball broke to D'Laryea about 16 yards out and with plenty of space. But his shot was well wide when he should have put it on target. At the other end, there was a let-off for Pressman when a corner floated straight over him but was put behind for another corner. If a Torquay player had got on the end of it, it would surely have been a goal. At half-time we reflected that the Stags were well worth their single goal lead. Soon after the break, Uhlenbeek cut inside from the right and sent a left-footed shot curling towards to the top right corner, but Marriott plucked the ball out of the air. Then Rundle got into a shooting position on the left as Uhlenbeek found him with a great ball. But Rundle sent a high shot towards the goal which Marriott plucked from above his head. There was a massive let-off for the Stags on 59 minutes. Torquay were awarded a dubious free kick 40 yards out, on the left. Left back Sharp floated a dangerous ball into the Stags box, and Barker headed it 2 inches past his own post from 6 yards. Amazingly the referee awarded a goal-kick. The excellent Reet hobbled off on the hour, to be replaced by Brown, a high quality replacement indeed. The Stags were finally put under some pressure from the lack-lustre home team, and on 66 minutes Bedeau was in too much space in the box, and Pressman had to be alert to save low to his right. Then Robinson fired onto the roof of the net, and on 75 minutes a free-kick was headed onto the top of the bar by Villis. 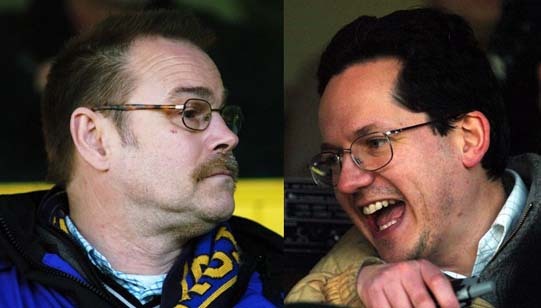 After the game Pressman claimed he had it covered, but his manager Shirtliff seemed less than convinced. Moments later Brown should have scored again. He broke again in similar fashion, but instead of going for goal, he tried to cross for two unmarked Stags players and managed to find the only defender within 30 yards. The game was up for Torquay though Bedeau went close as he was given too much space in the Stags box and hooked a shot wide from near the penalty spot with Pressman beaten, and then substitute Hill headed wide from 8 yards. But it was nowhere near enough and the home fans were streaming out long before the whistle. When the game did finish the Stags fans were in good voice and the players celebrated with them, just as they had in the last away victory, at Oxford, though no-one was taking their shirt off and throwing it into the crowd on this bitterly cold afternoon. Some great performances by the Stags players today, on a dreadful pitch. Reet, Baptiste, Barker, Hjelde and Wilson were all outstanding, with Reet just shading it as our man of the match. This was a massive, massive win and the league table looks a whole lot healthier now. The Stags are 15th, their highest position for months, and realistically just 9 points are probably needed from the final 11 games to ensure survival. But the Stags will want to finish the season as high as possible, and what better incentive could there be for 3 of the those 9 points to be picked up than next Saturday, and the chance for revenge over Notts County, who so cruelly grabbed the win at Field Mill early in the season. Indeed if the Stags could win at Meadow Lane next week it will take then above those pensioners. Come on Mansfield. Pressman 7 One mistake from a corner in the first half, but otherwise did well. Hjelde 8 Very good game, winning almost of all his headers in defence. Also set up the second goal. Baptiste 9 Outstanding as per usual from Bap. One block in the first half was memorable. Wilson 8 Terrific game at left back, especially in the first half. Uhlenbeek 7 Some good crosses, though blotted his copybook by losing the ball in dangerous positions a couple of times. D'Laryea 7 Not quite at his best after excellent recent form, but worked hard in the middle. Dawson 7 Did well and made some positive forward runs. Rundle 7 Did well for the first goal, and generally looked lively. Barker 8 Held the ball up so well as usual. What a player. Reet 9 Perhaps his best game in a Stags shirt. Looked determine to answer his critics with a strong display. Brown (for Reet, 61) 9 So sharp for the final 30 minutes. Scored one, brilliantly, and could have had three. Could be available for longer than we thought, thanks to his surgeon’s (lack of) availability. Subs not used: White, Lloyd, Jacobs, Arnold. Marriott, Lloyd, Woods, Villis, Sharp, Bedeau, Hewlett (Hill 53), Garner, Kuffour, Robinson, Connell (Afful 53). Subs Not Used: Taylor, Hockley, Coleman. A Bates (Staffordshire) 7 Handled the game well.